This is my version of the pm 38. I have changed the deck and added a center deck and added a back seat. Have not decided on what horse power will be on the PM 38, but will be around 50 or so, with the steering on the back deck. On the first float my wife and I had a 1952 7.5hp Mercury that did a lot better than I had hoped it would do to move the craft. This was a joy to build with the modification put to her, it is a project very satisfying. Hope to answer any questions you may have. I have never built a boat before, but I am contemplating building a PM-38. The plans show temporary triangular stands being used to support the keelson while assembling the framing of the boat. I do not see any cross-bracing of these temporary triangular structures in the plans. Did you use any cross bracing to make the framing stable? My garage has a concrete floor, and I do not want to drill holes in the floor to attach the frames to the floor. Did you secure the triangles to the floor? I have more pictures will take some of specific shot you may want. 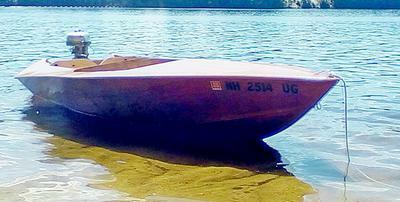 I built this boat from the plans from the Popular Mechanics 1962 or 1963 August issue. Bought all the lumber from local venders. The jig was very simple to build, make sure it is on a flat surface and you will be on you way. Keep a two foot square handy all the time and work off the center line to keep the boat nice and straight. Take one step at a time and you'll have a lot of fun. If you have any additional photos of the build and final product I would love to see them. I have been contemplating building one and powering with jet ski drive.